Marathi cinema brings different perspectives to love and romance. This time a sweet film Ranjan is about to make you see Love from the eyes of tow youngsters who are still far from the practicality of life. Ranjan comes from the production house of Ravindra Harpale. It is directed by Prakash Pawar. 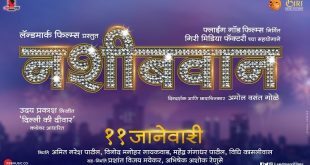 The star cast includes Yash Kulkarni, Gauri Kulkarni, Pushkar Lonarkar, Anil Nagarkar, Bhau Kadam, Bharat Ganeshpure & Vidyadhar Joshi. The story of Ranjan is written by writer Prakash Janardhan Pawar. Ranjan is slated to release on 17 February 2017. It has the love story of two teenagers as the crux. The story depicts the love and fantasy like world of two lovers who are yet step out into the world of power and money. The makers have released a small trailer and teaser. It is produced under the banner of Shri Mahaganapati Entertainment. Yash and Gauri play the lead role in the film. The song Lagira Zala Re has been released to great response. Few other songs have been release, they are catching up with the audience. The trailers show a school and the games the students play and how loves brews up between Yash and Gauri. Then the trailers proceeds to give us glimpses of Shivaji Raje’s valor. Ranjan is bound to be intriguing for both young and senior audience. Previous Love is in the air for Gashmir and Spruha!